Come volunteer your time with the Quincy Public Schools Foundation! We love our volunteers and have several opportunities available to donate your time to help our amazing students. Would you like to work with students? Then our Child/Family Mentor Program is perfect for you!!! Mentors can serve at any school and any grade level. Mentors are paired with a students and are asked to spend a half hour a week in this one-on-one supportive relationship program. 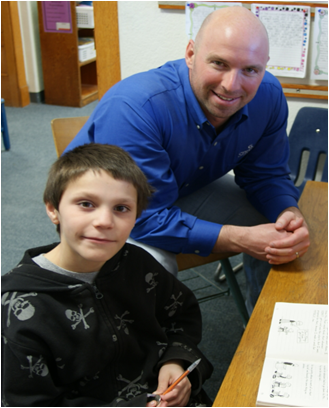 Please see more about our Child/Family Mentor Program here. Interested in helping QPSF in fundraising events? Opportunities are available to volunteer your time at our events or help in organizing events. Interested in helping with day-to-day operations? Opportunities are available to help with mailings, computer work, contacts, and many other areas. Just want to help but not sure where you fit in? Let us help you find a way for you to serve our Quincy Public Schools! Contact Mindy Holthaus in the QPS Foundation office at holthame@qps.or or 228-7158 x2276. Would you like to give your time?